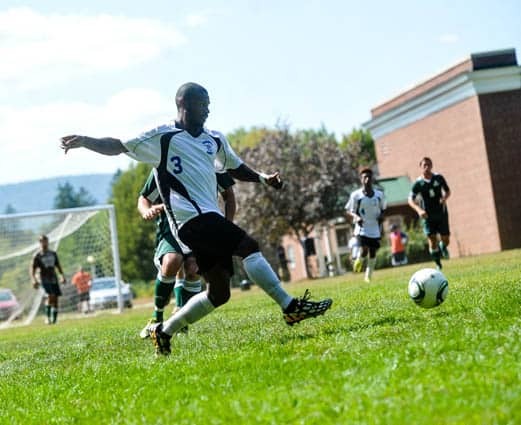 Dominick Simpson, a student athlete at the College of St. Joseph’s, kicks a ball at a recent game this fall season. RUTLAND—It was a busy week in sports for College of St. Joseph, led by the men’s soccer team who went 3-0, scoring a season-high ten goals against Hampshire College on Sept. 18. The softball team also had an impressive weekend, sweeping their home doubleheader against Southern Maine CC 17-0 and 8-0. The Lady Saints put both their pitching and their bats on full display over the weekend. The baseball team also completed the weekend sweep against Southern Maine CC, possibly their biggest threat in the conference. They won the first game in a tight 2-1, and then the offense came alive, outscoring their opponent 12-2 in the second ball game. Volleyball–the College’s newest varsity program – played two games against Paul Smith’s, who defeated the Saints in both matches 0-3. The men’s soccer team faced off against Paul Smith’s in a defensive duel where the Saints were able to pull off a 1-0 victory. Dominick Simpson was able to put the Saints on top, with yet another game-winning goal on his impressive season so far. The volleyball team also played Paul Smith’s, but was unable to get a win, losing their match set 0-3. Men’s soccer had their most impressive win of the season, finishing with a score of 10-1 over Hampshire College. It was a well-rounded effort for the Saints,where three different players scored multiple goals throughout the game. Kyle Milligan and Rosyvelt Baessa each scored two goals, and Dominick Simpson was able to get his first hat-trick on the season. Alex Andrade led the team with four points, assisting on three goals and scoring one of his own. Both the baseball and softball teams played doubleheaders, sweeping the competition. The Lady Saints dominated Southern Maine, winning their first game 17-0 and their second 8-0. Maggie Miller and Jenna Crowley were close to perfect on the mound, each throwing complete game shutouts. Fighting Saints baseball also earned wins over Southern Maine on Saturday, defeating them 2-1 in the first game and 12-2 in the second. The Saints again had dominating pitching, led by Ryan Cummings in the first game, and Joban Henriquez in the second. Freshmen offensively dominated the weekend as Jared Morello’s bat stayed strong with 4 hits on the day. Other Freshmen Benny Pena and Mauricio Rondon spoke loudly with their bats as well, as Pena was 5 for 5 on the day and Rondon collected 4 hits. Men’s soccer won 2-0 against Central Maine CC. Dominick Simpson scored yet another goal, officially putting him at first place in the conference with eight goals scored overall. The other goal in the game was scored by Edson Ferrer. Julio Garcia played great at goal, accumulating three tough saves throughout the match. The volleyball team put up a great effort, but was unable to get the victory over Paul Smith’s. The baseball team also had another sweep, defeating Adirondack CC.